Sparks fly, literally, as last week there was a transformer explosion at the Con Edison plant in Astoria, Queens. The explosion took place on December 27, at approximately 9:12 PM, and was caused by a malfunction with a piece of equipment that measures voltage. The resulting blue light was actually from the flickering of the machine itself. Con Edison workers were able to respond to the situation fast and efficiently, after inspecting the facility they were able to conclude that the malfunction was exactly that a malfunction; no evidence of tampering was found. Although there were no resulting casualties because of the explosion some employees did report having eye irritation after looking at the source of the blue light. 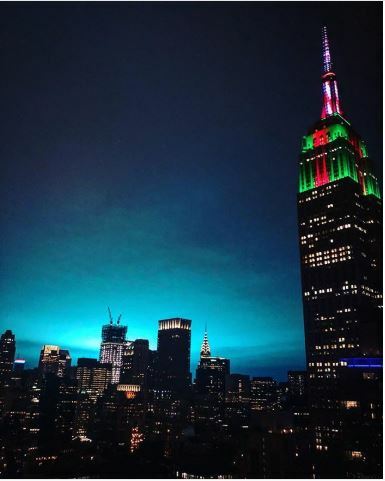 Caption: NYC’s skies light up with an eerie blue flash, it was visible all the way from Manhattan. LaGuardia Airport was temporarily crippled by the explosion and was unable to resume running fully on a backup generator until about 11:00 PM, almost two hours later. This, of course, caused massive delays in an airport where delays are already notoriously bad enough. The MTA, interestingly, was almost completely unaffected, with only the 7 train having extensive delays as a direct consequence of the explosion. Every other train line was running smoothly as expected. The effects on local residents were minimal with reports of a few power outages happening in the area. Although the explosion wasn’t a real cause for alarm it was a hot topic of discussion, residents all over New York City and even some from across the Hudson were able to see the flash. The explosion was left in most eyewitness’s memories because of the eerie, almost ominous, blue glow the explosion left in the sky. Some residents left their homes in a panic, not knowing what the explosion was and not wishing to stick around to find out. Despite near instantaneous responses from Mayor De Blasio and the NYC Police Department on Twitter addressing the issue and assuring residents, many residents had interesting theories to explain the explosion. Social media was filled with pictures of the eerie blue flash and comments with outlandish theories ranging from aliens have arrived that this is proof we all live in the Matrix. Our own Gov. Andrew Cuomo even made “light” of the situation by appearing on the news to give a statement about the event while holding an alien mask. Hey, I’m Byron and I’m a writer for the food section. What I particularly like about food is that it can lead you to some of the most interesting places. On my search for amazing food, I’ve ended up in places like Flushing, Astoria, and Korea town. I look forward to discovering new areas that I would otherwise not go to and to report back about them.